How to Work Around Common Low Voltage Problem Areas? Low electrical voltage is any voltage at or below 750V. In some regions, it can be used to define extra low voltage that is at or below 1000V. Common low voltage areas include residential utility lines, as well as light industrial application. With proper precaution, working around LV is safe. However, as with all matters electricity, sometimes things go horribly wrong. The following are key problem LV areas. In most of the cases, small projects only require a solitary person to sort it out, to reduce the interruption of routines that result from switching off the mains. Danger abounds in working alone, regardless of the size of the project. The substation has a number of primary sections. These include the incoming high voltage section, and the low and medium voltage section. Unfortunately, many workers only pay attention to the high voltage section, and seem to neglect the LV section by virtue of the fact that the voltage there is low. Unfortunately, the LV section has high current due to reduced impedance. The high chance of high current, especially in the constricted space makes for a very risky area. Working on an energized system can never be justified, regardless of level of experience. However, in most modern substation designs, the risky sections are electrically isolated. This allows for safe working environment without de-energizing all the equipment, which may lead to power disruptions. Fig 1: How to tell a HV from a LV substation? Engineers and technicians usually use is a meter to check voltages. 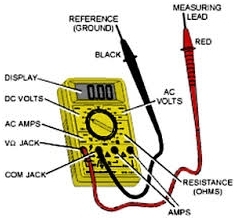 The testing can turn out to be a dangerous venture for the inexperienced, for example using the meter to check the current rather than voltage can result to electrocution, as the ammeter’s low resistance provides the path for high current flow. Inexperience can also lead to the use of wrong and improvised equipment for testing: for example, screwdrivers to encourage sparking between energized parts to confirm presence of power and use of non-standard equipment. In other instances, the electrocution is purely accidental: for example, as workers lean to insert probes for the testing and get into contact with the energized equipment. In places with high risks, or if the probe points seem out of reach, insist of goggles or a full facial mask to protect yourself from burns arising from arc flashing. Risk is defined as the likelihood of happening and severity of the consequences. The engineer in charge should, in person asses the various areas with identified hazards. The list should precisely indicate the location of the hazard, and classify the risk from minor to fatal. A given example is a short exposure to low voltage. This should be classified as a minor risk compared to an extended period of exposure to higher voltage. However, regardless of risk level, the primary recommendation is to install measures that eliminates or reduces all risks, regardless of severity. As engineers, sometimes the experience and education level does get to our heads. In such instances, we seek shortcuts and cut corners, mostly to reduce in project time. It is important to note that the profession is unlike any other, as our regular working environment features high risks that may lead to severe injuries and fatalities. This holds constant regardless of whether the voltage is low or high. With such in mind, it is recommended that you exercise due caution in all aspects of the projects. or copy this trackback: http://engineering.electrical-equipment.org/safety/how-to-work-around-common-low-voltage-problem-areas.html/trackback from your own site.